Stayed 24th October 2013. Tony made us feel very welcome and couldn’t do enough for us. Service above and beyond our expectations! Excellent choice of breakfast and served very promptly as we were in hurry. Well worth a stay if you’re in the area. Have stayed here for 3 nights every year for about the past 6 years. The standard is consistently high. Rooms are spotless, food is excellent. Mairead and Tony treat you as one of the family and go out of their way make you feel at home. We have already booked for next year and will not consider anywhere else for the foreseeable future. It’s good when a business trip is a home from home. We stayed with friends here, there was four couples, we were attending a wedding in a local hotel, it was early Sept 2013, well it is a fantastic place to stay, location was great and close to a lot of amenities. Mairead and Tony could not do enough for us. Rooms were immaculate and very comfortable. Breakfast was excellent and plenty of it. We would all recommend the Orchard Grove. Thanks for a great stay Mairead & Tony! Just a little note to thank you so much for the hospitality you gave us last Wed evening.You must be very proud of your lovely house and surroundings!, and of course we enjoyed the meal at the pub down the road, and the cup of tea when we arrived back at your place. We thoroughly enjoyed the break and feel quite refreshed this week. The weather is still beautiful with us. Once again many thanks for everything and if you are ever in Wales remember to give us a ring, we would be pleased to see you. Thank you for a wonderful stay with you. Chris, Pam, Den & myself cannot express our gratitude enough. first class accommodation and food better than a 5 star hotel, wonderful & friendly host & hostess. I have just done my three day diet, but I will be doing it for a long time! The weight gain was terrific but your cooking was just first class. I could not resist it. Once again thank you both, we will possibly see you in 2004 as I have just booked a cruise for next year, but we will all be back to you, your welcome was first class. when I go home I will highly recommend Orchard Grove to my friends! Many Thanks! 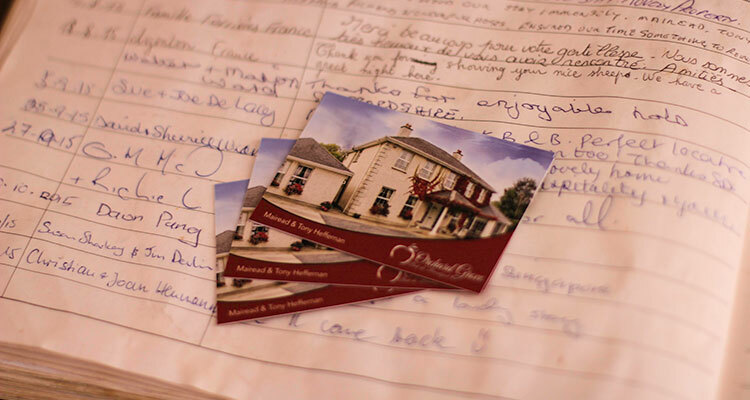 We’re still working out way around Ireland – in Co Tipperary now, haven’t been in a B&B as great as your anywhere though! Greg’s cooking prowess has reached new levels – his Guinness stew is addictive! Hope you and the family are all well, have a lovely Christmas together – would love to see you in Melbourne if you get there. You have a wonderful way of making others feel welcome. We had such a wonderful time at your B&B. Everything we did and everyone of you made our stay a joy we will never forget. We have had a wonderful time in Ireland. Not long enough but we will be back. Your cottage is very nice and comfortable. If you are ever in out part of the country you will be most welcome we have 2 spare rooms. Thank you for the lovely place to stay. We have loved every moment and hate to leave. A special thanks for the extras – the fresh flowers, the scones 7 jam. juice, milk, etc but especially for your friendship and the evening we spent together. We both enjoyed the evening and your company. If you are ever in the Niagara Falls area please give us a jingle. And you can be sure if our travels bring us back your way we’ll be staying with you! I hope everything is fine with you. I will treasure my good memories of staying at your place – be welcome in our home if you ever come to Holland. Hug. If you ever have stayed in Orchard Grove, please let us know what you think. We always strive to do better in making your stay as memorable as possible!